We are launching our seventh annual Tattooed Poets Project with Lisa Marie Basile. Lisa and I have been talking about her participating since the fall of 2012, so I was delighted when we were finally able to get a post together for Tattoosday this year. The tattoo on her forearm reads "recuerdo la eternidad," which roughly translates to "remember eternity," comes from a line out of a Marosa Di Giorgio poem. "She's my favorite poet," Lisa Marie explains, "and I find the way she talks of nostalgia and good/evil so beautiful." She adds,"This line immediately hit me, and I wanted to always have it with me, in its original language." Lisa Marie's ampersand (&) sits on her wrist and she explains, "I not only love the shape of this little one, but I think the idea of the ampersand connecting this and that is beautiful." "[It] comes from The Stranger by Camus. This is one of my favorite books, and I felt very connected to the rage and fear and sorrow the protagonist felt when he was on the beach, under the sun and near the sea. This was my second tattoo and I feel closest to it." "witch is a playful one that I got with a friend at midnight in Miami on Friday the 13th. It was all very kismet, actually. 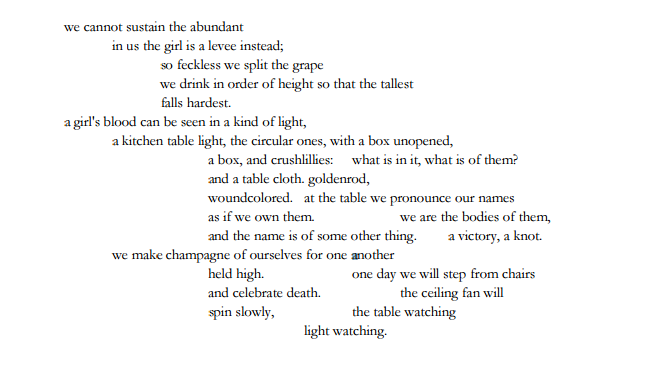 We both have the same tattoo (poet Joanna C. Valente) and it, for me, represents the idea of women living through being hunted, scarlet-lettered and hated. It was an impulse tattoo." 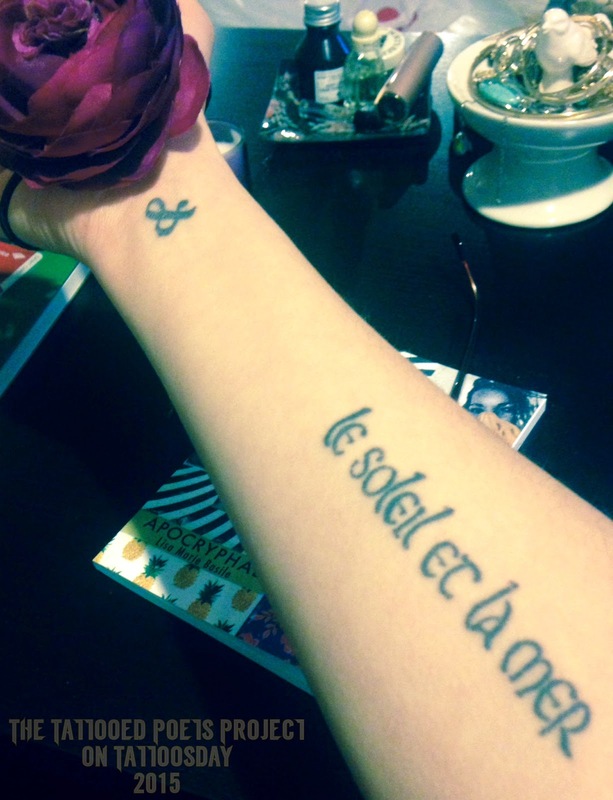 She believes that the "&" and "le soleil et la mer" pieces were inked at Whatever Tattoo in Manhattan. The "recuerdo la eternidad" tattoo was done at Eight of Swords in Brooklyn. The "witch" tattoo was from Salvation Tattoo Lounge in Miami. Lisa Marie Basile is the author of APOCRYPHAL (Noctuary Press, 2014) and a chapbook, Andalucia. She is the editor-in-chief of Luna Luna Magazine and her poetry and other work can be read in PANK, Tin House's blog, Coldfront, The Nervous Breakdown, The Huffington Post, Best American Poetry, PEN American Center, Dusie, and the Ampersand Review, among others. She’s recently been profiled in The New York Daily News, Amy Poehler’s Smart Girls, Poets & Artists Magazine, Relapse Magazine and others. She’s been nominated for the Best Small Fiction 2015 and Best American Experimental Writing 2015 anthologies, and she holds an MFA from The New School. Lisa Marie's first full-length just came out: Apocryphal can be purchased on Amazon or at Small Press Distribution. Thanks to Lisa Marie Basile for helping launch the seventh annual Tattooed Poets Project on Tattoosday!